NYC, August 4th -- She works hard for the money. Hello Kitty donned her fanciest career coordinates yesterday to ring the closing bell at the New York Stock Exchange. However, judging from this photo, it looks like she was looking to make some trades of her own. Dear Daniel better watch out! 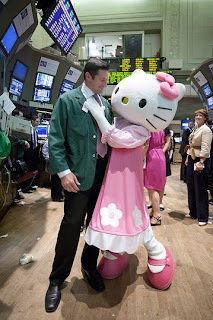 The feline publicity stunt was in honor of Sanrio's 50th anniversary. ”We’d like people to know Kitty more,” said Sanrio Vice President Kunihiko Tsuji.